When We Get Carried Away !!! With an extra special body. 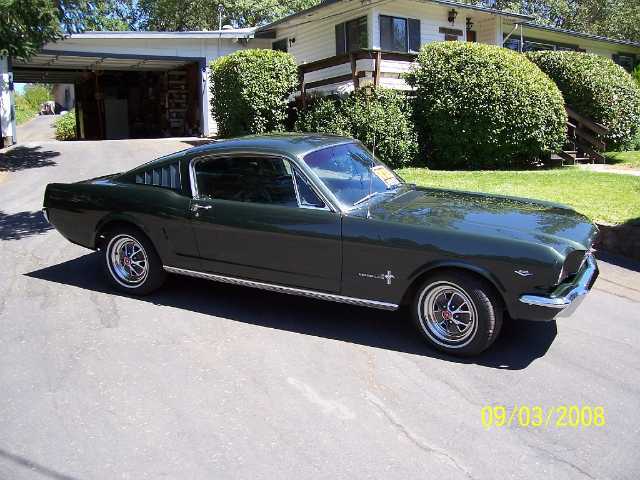 The body on this 65 Mustang is much straighter than most all other Mustangs. The true defining characteristics that distinguish the cream of the crop, from the average, run of the mill bodywork, only truly becomes apparent as viewed from close angles down the body panels. For example, the closer one gets to the back of the car, while looking down the side of the car toward the front, the more likely one will see ripples and waves in the body panels. Originally, these Mustangs did not have very good panels, at all, period. There were lots of waves and ripples, and the panels just didn’t fit together very well. I always liked the style of these bodies, but just never liked the quality. So many years ago, I spent several years worth of time focusing specifically on learning how to make these bodies very accurate. Back in 1994, I did this body with, and for, my friend Steve Fox who wanted to drive it. At that time, it would likely have cost in access of $30,000 just to have the body as straight as this one was, and for the most part still is today. Those who can recognize, and appreciate, high quality bodies will know that 2D pictures can never really do them justice. You just can’t really see all the depth, and details, that you can when you look at something in person. Some of these shots are taken to try to overcome those limiting obstacles, but they still fall short of the real thing. The picture below is one of those shots. Click here for more detailed info on body specifics, including more quality photo links. This article also includes tips that can be used to more easily perfect quality bodies. If you're interested in such knowledge, check back from time to time in the Body Tips link on the left. In the past, I have had guys beg to work for me for free, just to learn how I do these bodies. Lord willing, I am hoping to to add some of what I have learned over the years to that section, as time goes on, including newly developed tools to help make accurate ripple free bodies more quickly. The angle of the lines is thrown off by the screen pixels. There is no orange peel. The larger the image, the easier it is to see the quality. At the time we did this project, Steve primarily wanted a really cool looking car that he could drive around a bit. I primarily wanted to practice making these gradual curves very accurate, for these and other projects, so we put together a little deal stating I would do this car for him, in exchange for flight training and time. As it has worked out, I have been so busy with more important projects and assignments, that I haven’t used up much of my flight time. Steve ended up moving to Alaska only 2 or 3 years after the car was done. So it has been stored in local hangers for most of the last 14 years. The hanger space is now needed for other uses, so we decided to sell the car. When Steve got the car, as I recall, the front suspension had been taken apart. Steve cleaned it up and put it together with all new parts, and an extra heavy duty sway bar. Recently, the front end was realigned, and new tires were put on the front. The shop said everything was still nice and tight in the front end. Steve put in new carpet, re did the dash, and I think the front seats received new covers, or at least they look pretty new. The back seat cover looks in good condition, but upon close evaluations, it doesn’t look as new as the front covers. New carpet was installed, so the interior looks almost new. Unfortunately, there are a few scratches in a couple of the windows. The mustang is pretty sound mechanically, and is mostly original, but it has not had a complete frame off restoration. There is just a little lifter noise for time to time, and I think a rear wheel bearing will need attention one of these days if someone is driving it a lot. The extra high quality of most of the body is its greatest asset. I am hoping to find someone who really appreciates the effort that went into that. Though there are a few spots that I personally would want to touch up a bit, most people would probably be happy just to have this sitting in their show room. Check out the complete Picture Gallery. We prefer to deal in person, and with cash.